Turck’s enhanced Li linear position sensors measure position values at a frequency of 5 kHz at measuring lengths of up to 2 metres. Turck has updated its contactless Li Q25 positioning systems and has now added new extended variants to the program. The inductive measuring principle offers improved shock resistance and sampling rate compared to alternative measuring systems. With measuring lengths of up to 2 metres, the Li sensors outperform magnetostrictive linear position sensors, which, due to their operating principle, sense at a slower rate as the measuring length increases. Li sensors, with their immunity to magnetic fields, are generally ideal for closed-loop control tasks in the metalworking industry, as the metal shavings accumulated here do not stick to the positioning element inducing linearity errors. Thanks to their shock resistance, they can be used for position measurement in presses and punching machines without any problems, as well as in wood processing or injection moulding machines. The Li linear position sensors always supply their output signal twice: as a 0–10 V signal and as 4–20 mA signal. This makes it possible to connect diagnostic systems and also reduces the number of device variants to be kept in reserve. 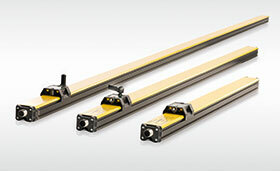 Turck is offering the new devices in measuring lengths of 100 to 2000 mm.